13, Simpang Empat, Jalan Lahat, 31450 Menglembu, Ipoh, Perak, Malaysia. 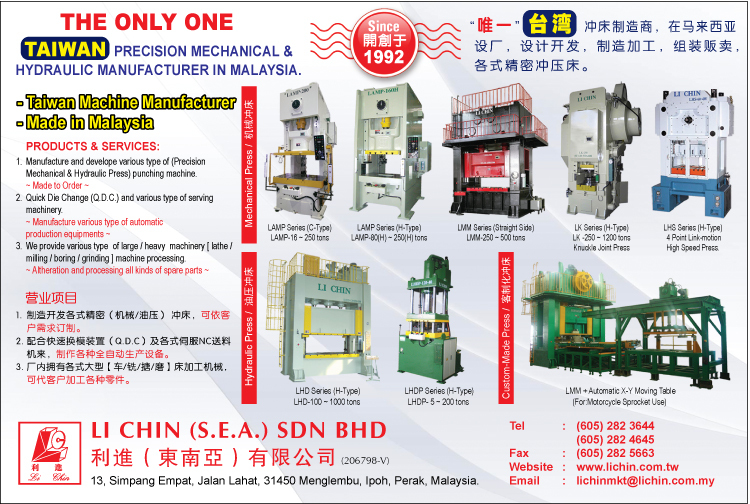 LI CHIN are specialists in the design and manufacturing of Presses and Stamping System. LI CHIN are also specialists in the design and manufacturing of home appliances production equipment which related with refrigerator, air conditioning, washing machine and so on. Our company enhance the cooperation with international well-known home appliances company eg:Panasonic, Hitachi, Sanyo, Sampo and etc... , to provide precision stamping and home appliances related equipment. Enhance the quality of home appliances products and promote the competitive ability in the world market. We are engaged in developing high quality products. Our company also undertake to supply complete Turn-key fully automatic stamping systems, incorporating not only the presses but all the required peripherals (Material Feeding Line, Transfers Robots, quick die change (QDC) device, etc.) achieving very integrated and well proven Turn-key systems for our customers. In year 1992, established branch office in malaysia: LI CHIN (S.E.A) SDN. BHD. Specifically responsible for the development of stamping market in South Ease Asia. Simultaneously, LI CHIN (S.E.A) SDN. BHD. Also provide a variety of large-scale fabrication works. Good customers service and after sales maintenance have been always LI CHIN's management slogan and concept for business enhancement that not only sustain the image locally but also outside Taiwan, such as Malaysia, Indonesia, Singapore, Thailand, Philippine, Mainland China, Germany, Poland, Spain and Turkey.